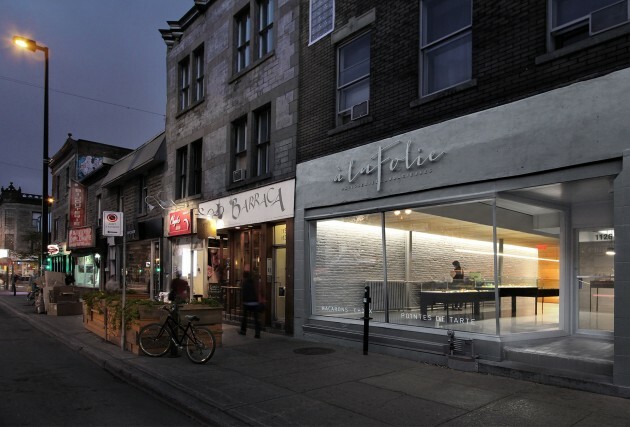 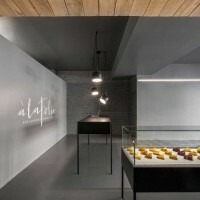 Atelier Moderno together with Anne Sophie Goneau have designed Patisserie À La Folie, a contemporary pastry shop and storefront in Montreal, Canada. 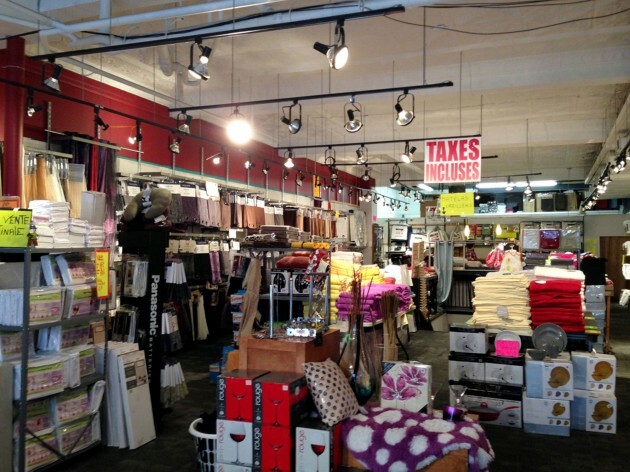 Make sure to look at the before photos to see the dramatic transformation. 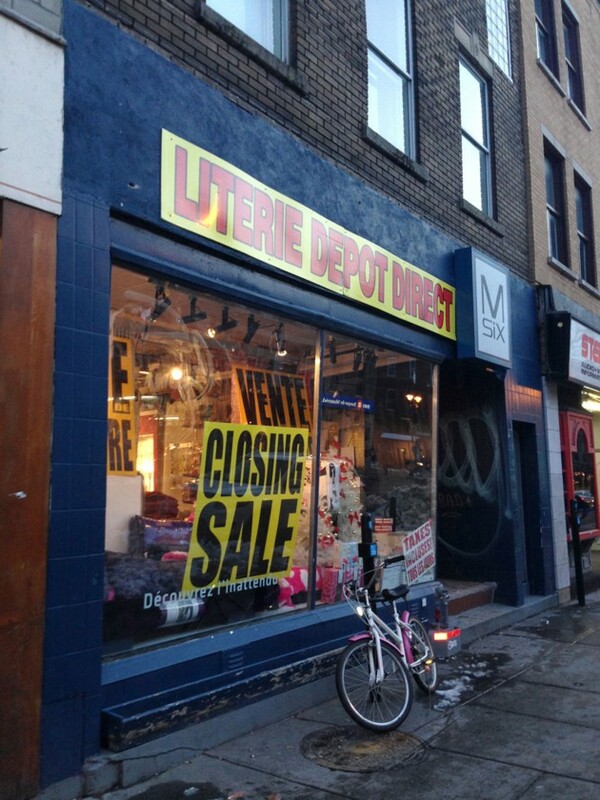 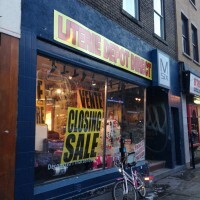 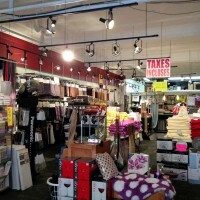 The two photos below are what the retail space looked like before the redesign. 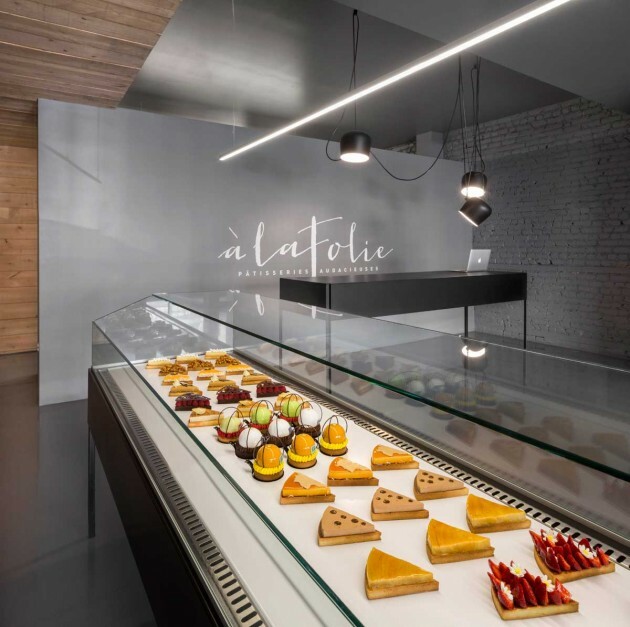 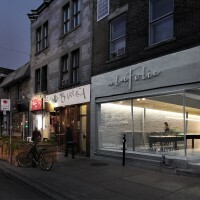 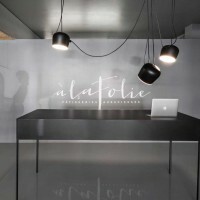 The design of the new address of the patisserie À La Folie aims to defy all typecasts of the conventional pastry shop by giving full prominence to the superior presentation and quality of its unique products. 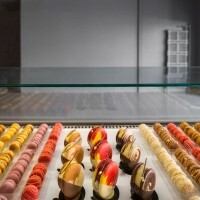 the senses, and the focus becomes only the pastries themselves; the customer almost begins to taste with their eyes! 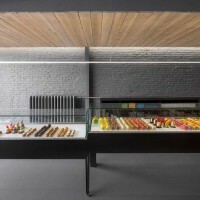 All pastries are made in-house, with the production floor set in the rear of the space. 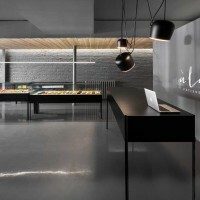 It is separated from the shop area by a mid-height wall that encourages the sounds and smells of the kitchen to tease the senses of the patrons beyond. 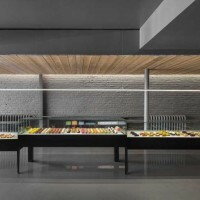 A theme of assemblyline production is demonstrated by a band of hemlock slats that extend above the dividing wall and span the full depth of shop space, recalling the aesthetic of the wooden pallet or the conveyor belt. 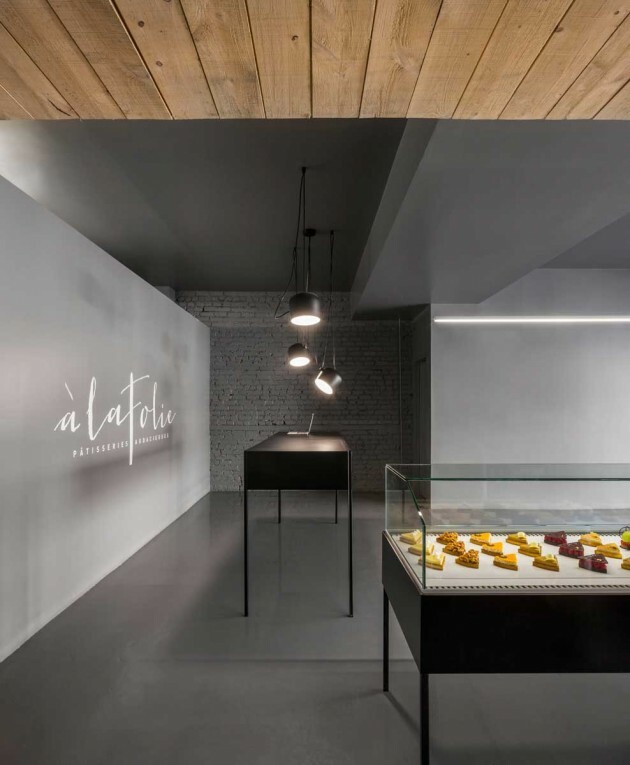 The refrigerated display units sit below the wood cladding, while thin and delicate LED suspension defines this exhibit area with its focused and dramatic illumination. 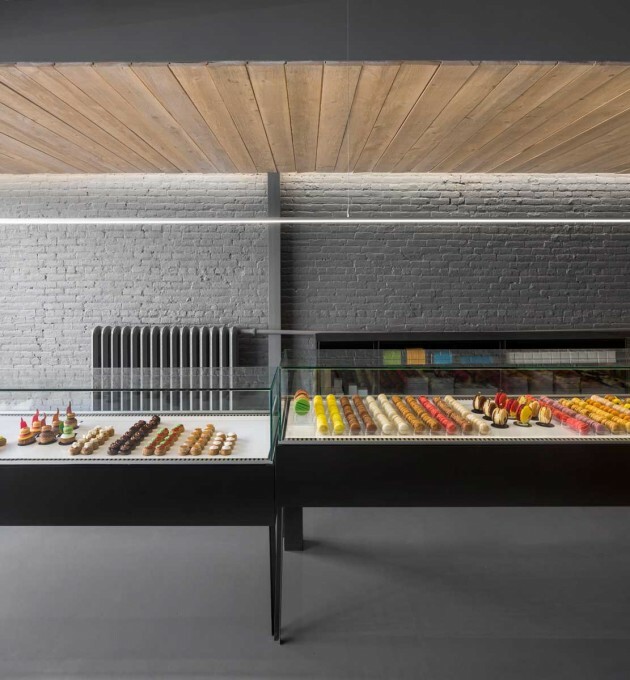 The black steel display units were custom designed and fabricated to stand independently; the compressors for each unit are positioned in the basement below, allowing the displays to stand on dainty steel legs, in continuity with the adjacent storage and cash counter units. 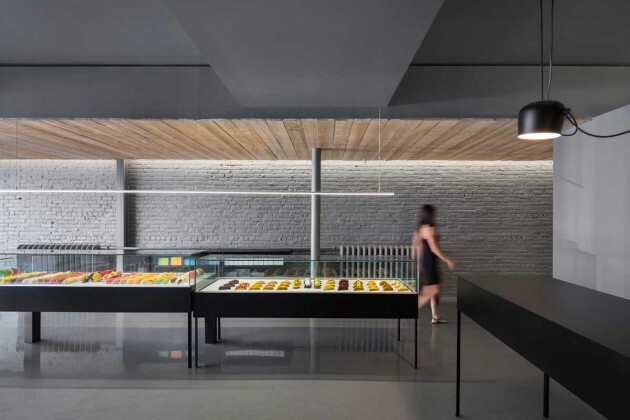 The cash counter itself is accentuated by the chaotic lighting of the AIM pendant lamp (by Ronan and Erwan Bouroullec).